1989 – What an awesome year for rock music! Where do I even begin? After being a rock music enthusiast for so long, I can with an absolute clear conscious declare 1989 as one of the best years of rock music! It was the end of a strong, rock&roll decade, grunge music was already becoming a formidable force on the scene, so it was basically do or die for many returning or debuting bands. Out of this turbulent, trend-shifting period, however, tons of great releases managed to come out and leave a memorable trace behind them. From one of Eric Clapton’s strongest albums, featuring a Grammy winning song, to powerful, multi-platinum debuts, such as Skid Row’s eponymous album, 1989 was overflowing with excitement and monumental rock music! With time, I also came to the conclusion that many of my personal favorite hard rock albums were released around that time as well. Plenty of those records came out in 1989. For the fun of it, I decided to prepare this little list, consisting of 15 albums that to me had (and still have) the best, most appealing and intriguing musical presence during 1989. It’s a personal selection, based on my liking and preferences but I would love to know more about your favorite 1989 albums! Enjoy my list and feel free to comment and share your thoughts and selections! Cheers! Eric Clapton always comes first when it comes to my personal selections, especially if we talk about his 80s’ releases. “Journeyman” was the absolute peak of Eric Clapton’s career, featuring a Grammy winning song, “Bad Love” and tons of other beautiful blues tunes, such as “Before You Accuse Me” and “Hard Times”. What really impressed me was Clapton’s obvious confidence on “Journeyman”. He overcame his alcohol abuse and all the other ghosts of the past and released one of the most phenomenal blues/rock albums of all time. The album definitely sounds modern, more pop-influenced, rather than strictly focusing on that heavy blues mood, Clapton adores so much. Some of the other highlights and personal favorite songs from “Journeyman” include “Pretending”, “Anything for Your Love”, “Old Love” and “Breaking Point”. It’s definitely an album worthy of your time and appreciation! Norwegian rockers TNT completely blew me away with their 1989 release, “Intuition”. It quickly became a personal favorite and an album I simply cannot live without. 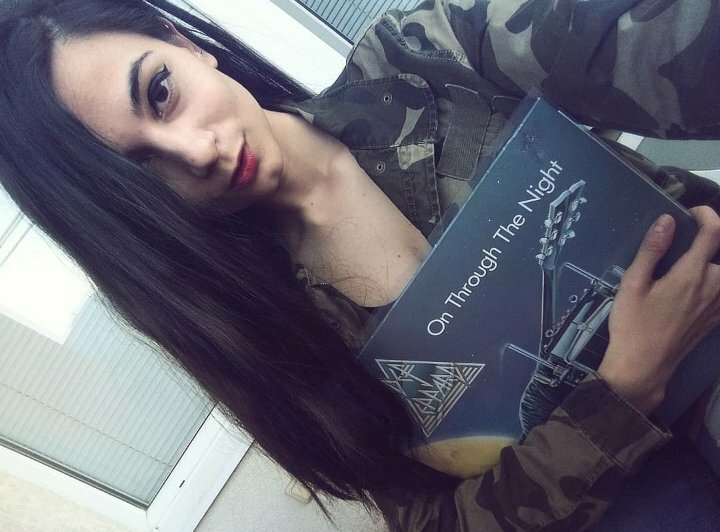 I often say that it’s extremely underrated – I mean, just listen to the catchy, outstanding rockers, including the title song, “Caught Between the Tigers”, “Forever Shine On” and of course, one of my FAVORITE songs of all time, the power ballad “Tonight I’m Falling”. “Intuition” didn’t really make a huge splash on the charts or sold that well, compared to other similar glam rock releases of the era; however it did manage to conquer my heart with just one listen. Tony Harnell is a brilliant vocalist and I will forever be thankful to him and guitarist Ronni Le Tekrø for crafting such an enjoyable piece of art. Giant’s “Last of the Runaways” is one of the most underappreciated rock releases of all time which I think is unforgivable! In addition to the famous power ballad, “I’ll See You In My Dreams”, “Last of the Runaways” has so much more to offer. The whole debut album is just simply a beautiful, well-balanced selection of arena rock tunes, perfectly demonstrating the artistic skills and qualities of Giant. “Innocent Days”, “Can’t Get Close Enough” and “No Way Out” are just a few of the dangerously obsessive rock gems that could be heard on this album. “Love Welcome Home” and “It Takes Two” are also some of the highlights! Once again, the timing wasn’t right for those talented guys. Let’s not forget Dann Huff who brought so much character to “Last of the Runaways” with his emotional and unforgettable vocal delivery. The Scottish AOR/Melodic rock band, Strangeways’ third album, titled “Walk in the Fire” was the reason why I got to know them in the first place. I played the first track – “Where are they Now” and I was immediately captivated by the gorgeous melody and the superb killer-vocals of Terry Brock. Their Americanized sound can be characterized as mixture between Journey, Boston and Bad Company, but with a little something extra. In addition to “Where are they now”, some other highlights include the charming power ballad “Love Lies Dying” and the uplifting “Every Time You Cry”. “Walk in the Fire” didn’t really achieve commercial success, despite its first class AOR qualities. The album, along with the band should’ve been so much bigger back in the day. Nevertheless, they are worth discovering. I can’t recommend this album enough. Danger Danger debuted in the summer of 1989 with a self-titled album, strictly following the well-established glam rock formula for success. Fueled with catchy, rhythmic and easy to absorb tunes, the record could easily be described as an “enjoyable Friday night experience”. To be fair, the record does sound a bit too generic and can’t really stand out with an exceptional musicianship, outstanding vocal delivery or profound lyrics. Nevertheless, this melodic hard rock jewel can almost guarantee you a perfect mood which is the reason why is on this list! “Naughty Naughty” and “Bang Bang” were released as singles and turned into Danger Danger’s best-known classics. (Those guys really enjoyed double titles.) Both tracks are fun and highly entertaining, despite their obvious commercial-driven goals. “Saturday Nite”, “Rock America”, “Feels Like Love” and “One Step from Paradise” are just a few of the other satisfying rockers who made this album so appealing to me. Danger Danger got all the pieces of the puzzle with this project; however they were 5-10 years later for the party. This album would’ve got so much attention on AOR radio! Swedish rockers Treat grabbed my attention with their third album, “Dreamhunter” (1987), however their 1989 release, titled “Organized Crime” turned me into a die-hard fan. I always felt so sad because despite being so talented, they couldn’t become a household name in the 1980s melodic rock scene. Anyhow, back to “Organized Crime” – their fourth release is home to mind-blowing rockers, such as the unbelievably catchy “Get You On The Run”, “Party All Over”, “Keep Your Hands to Yourself” and the beautiful ballad, “Stay Away”. Attractive melodies, smooth vocals and hard-rocking sound are just some of the reasons why I think that there’s absolutely no way this album can’t win over any melodic/AOR fan. Another debut and another perfect rock album! “The Disregard of Timekeeping”, the first actual attempt of Jason Bonham to hit it big commercially, became a reality in 1989. The project caused quite the stir among the rock fan communities but it was only natural – the son of legendary Led Zeppelin drummer was about to unleash a new force to the competitive hair metal musical market and fans just had to see through it all! “The Disregard of Timekeeping” spawned exceptional songs, including “Guilty”- a song that won me over with its mesmerizing intro, unparalleled vocal delivery by Daniel MacMaster and that soul-demolishing violin solo by bassist John Smithson. “Wait for You”, “Playing to Win” and “Room for Us All” are other worthy and highly memorable moments on Bonham‘s 1989 debut. Fronted by one of the most charismatic and talented vocalists of all time, Sebastian Bach, Skid Row‘s self-titled debut became one of the best-selling and most influential albums of the year. “Youth Gone Wild”, “18 and Life”, “I Remember You”, “Piece of Me” – do I have to say more? There are plenty of reasons why this album got certified 5x Platinum by the RIAA and you can easily discover them if you listen to it from start to finish. “Skid Row” brought that much-needed sass and danger into the music scene, incorporated among serious melodic riffs. MTV loved them as well, which further more boosted their image as the new hot kids on the block! What else is there to say – it’s an amazing and highly entertaining album and no wonder it’s on my favorite 1989 albums list! John Sykes proved that he is a worthy monster guitarist as a member of household names such as Tygers of Pan Tang and Thin Lizzy. Then, he and David Coverdale crafted what is often considered as one of the most enormous hard rock records of all time. Yes, of course I’m talking about that influential 1987 album that spawned timeless hit singles like “Here I go again”, “Still of the Night” and “Is This Love”, known by every single soul on this universe. After they went their separate ways, John Sykes formed Blue Murder and in 1989, they released their self-titled, debut album, which is yet again a highly underrated album, despite its out-of-this world qualities and songs that are able to conquer every part of your soul! I’m not exaggerating, believe me – if the timing and situation was different, this album would’ve been so huge! Some of the earth-shattering songs on “Blue Murder” include “Riot”, “Black-Hearted Woman” and the title track. Of course, the sweetest moments come in the face of “Valley of the Kings” which is one of those tunes you can play for days and naturally (at least for me) the mesmerizing ballad “Out of Love”. In the summer of 1989, Mr. Big became one of the many bands to release a debut album. The eponymous record did manage to leave an impression on the charts and it did sell over 300,000 copies in just a year, so we can conclude that it was somewhat successful. It did, however, deserve way more than that. I still remember the first time I heard the opening track, “Addicted to That Rush” – it was like a powerful shot of adrenaline and it made me feel so good! The entire album is one energizing piece of music that was made to give you that much needed kick! “Wind me Up”, “Had Enough” and “Blame it On My Youth” are just a few of my favorite tracks that could be heard on “Mr. Big”. Paul Gilbert and Eric Martin are an exceptional team and I have nothing but respect and adoration for this album! Tesla!!! Where do I even begin? I love this band and this album so much!! In 1989, Tesla released their sophomore album, titled “The Great Radio Controversy” – an album I first got to know through the groundbreaking ballad, “Love Song” which is so unique and different from all the other power ballads released at that same time. That’s not all of it though. The entire album is one splendid mixture of blues, hard rock, pop rock and metal. On top of it all, the distinctive vocals of Jeff Keith made sure that I will forever remember and hold this album dear. In addition to that well-known ballad, “The Great Radio Controversy” is home to one of the most empowering tunes – “Hang Tough”. “Lady Luck”, “Paradise”, “Lazy Days, Crazy Nights”, “Be a Man” and basically each and every other song on this album are highly spirited and so easy to fall in love with. “The Great Radio Controversy” was certified double platinum for a reason! The unquestionable commercial highlight of Great White’s career has to be “…Twice Shy”. I’m not saying it’s their best album but it most certainly is an amazing release, worthy of acknowledgment. Great White’s cover of Ian Hunter‘s “Once Bitten, Twice Shy” and of course “The Angel Song” are the most popular tunes that came out of the album, conquering charts and leaving a timeless trace. Moreover, “House of Broken Love” is yet another highlight, dedicated to the love struggles vocalist Jack Russell and guitarist Mark Kendall were going through at that time. “Baby’s On Fire” and “Heart Hunter” are a couple of my other favorites on the record! “…Twice Shy” got certified double platinum and is still considered as one of the staples of ‘80s glam rock! Produced by none-other than Don Dokken himself, XYZ’s self-titled debut turned into another one of the underrated highlights of 1989. All in all, “XYZ” is an album that could have easily blown out any other hard rock album of that era, even the multi-platinum ones. Fantastic stand-out tracks such as “Inside Out”, “What Keeps Me Loving You”, “Take What You Can” and “Come On N’ Love Me” deserve nothing but to be enjoyed and played as loud as possible. Frontman Terry Ilous is contributing significantly to the overall satisfying experience that is this debut release. Tons of talent and full of character – I can’t recommend this release enough! I am a huge Kingdom Come fan so no surprises here. Their sophomore album, titled “In Your Face” is a worthy follow-up to their well-deserving debut album and the second of the trilogy of good releases by Kingdom Come, at least in my opinion. “In Your Face” impressed me with uplifting songs like “Who Do You Love”, “The Wind” and laid-back tunes such as “Just Like a Wild Rose”. All in all, “In Your Face” is an enjoyable album and despite the obvious influences, drawn by Led Zeppelin, I do enjoy listening to this record from time to time. I agree that it’s a bit inconsistent and it does have its flaws but if you like AOR, you’re gonna love this, just like I do! Last but not least, I just had to include Whitesnake’s eight studio album, “Slip of the Tongue”. Many people, including David Coverdale himself think of this album as one of Whitesnake’s weakest releases; however that’s definitely not what I think. As a matter of fact, it’s my favorite Whitesnake album and a couple of songs are the reason why. “The Deeper the Love”, “Judgement Day” and “Now You are Gone” have been an inseparable part of my daily playlist for so many years. Let’s also not forget about that impressive re-recording of “Fool for Your Loving”. Sound shift or not, Whitesnake did wonders with this glorious hard rock album and I will forever defend its greatness. The publication expresses my personal opinion and in no way is trying to make a generalized statement. The publication presents a selection of 15 albums, picked based on my personal preferences and ideas, fitting the purpose of this article. Please be kind and considerate when you read and/or comment. I don’t own any audio or visual material used in this publication. All the rights and credits go to the owners and/publishers. Great List….McAuley Schenker Group – Save Yourself could be in that mix too! I have most of those albums being a big fan of hair metal myself. Great music And the best of times.